The last podcast for Eddie Def Month is a banger. Some collectors may have heard this track before, but for those of you who haven’t, go buy some Cisco, put Crown Royal velvet bags on your hands and turn up your speakers. Gurp City would like to thank Eddie Def and DJ Passion for lacing us with these dope tracks. Keep ’em coming! Conceit Video Finalist In Youtube Contest. EVERYONE MUST GO VOTE!!! The “Rap on The Rise” Youtube video contest is down to the final 20 and Gurp City has a representative holding it down. Conceit’s homie made him a video for “Scissors and Glue,” the video was entered, then Fiddy Common and POLOW figured he had what it takes to be in the top 20. Watch and rank the video as many times as possible and we’ll keep you up to date as soon as we know more. G-G-G-GURP U-NIT!! Go the contest page and VOTE FOR CONCEIT NOW!!! and every hour on the hour. 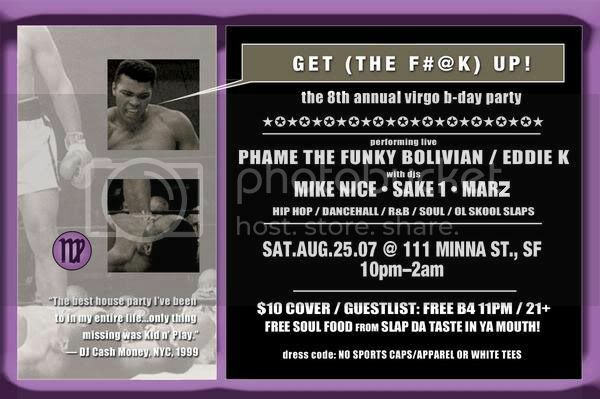 Dont make plans Aug. 25. DJ Marz and Eddie K already made em for you. Eddie Def keeps comin’! Podcast 4 is filled with drops galore. The first person to leave a comment with the correct name and order of all the drops, will be sent a limited edition “Don’t Be A Hurricane Dean” Gurp City T-shirt. This week also features a throwback picture of Eddie Def’s Living Room Lab to save as your Desktop Wallpaper. On September 7th at Milk Bar in San Francisco, Bored Stiff will be having their Record Release Party. Performances by Bored Stiff, Gurp City’s Z-Man, and Hella Records artists Co-Deez, Spank Pops with TD Camp on the wheels. 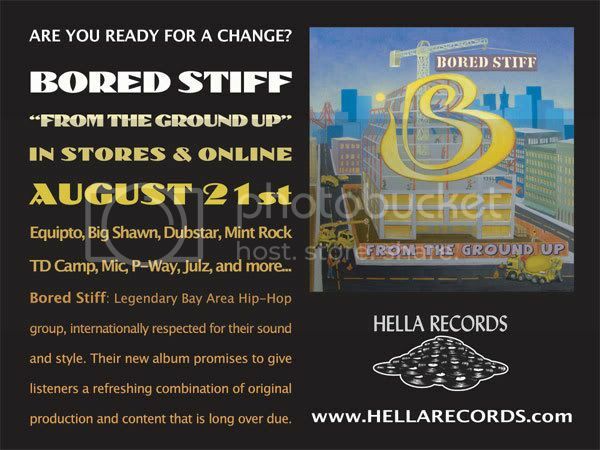 If you don’t know about BoredStiff then you need to do your Bay Area rap homework. All the Gurpites are anxious for that new album as should you be. Good people here. peep the Z-Man cameo at the end. In the second week of Eddie Def month, we continue Gurp City’s exclusive K.I.T.T.Y. radio podcasts from Eddie Def’s dungeon. This week featuring two tracks. In the first, Ed Def claims his territory and states his thoughts on hip hop through his crossfader and samples. This second track shows Ed’s versatility transitioning through remixed throwbacks sprinkled with heavy scratching then leaving listeners with signature hampster breaks. 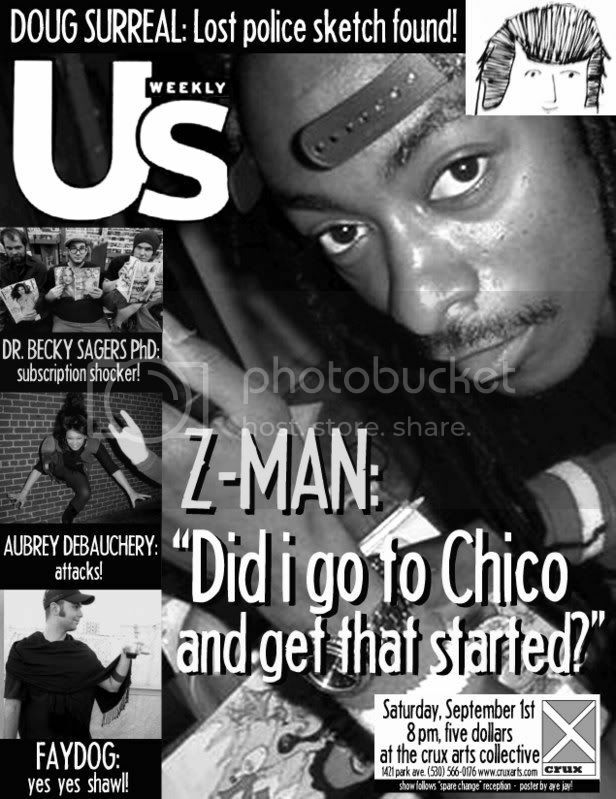 Gurp City Artstars, Z-man, Faydog, Matt Loomis and Aye Jay! are having a group show at the Crux Arts Collective in Chico, CA on September 1st. The artist reception is from 8pm-9pm and after that Aubrey Debauchery and Doug Surreal will playing. This event is also Aye Jay!’s release party for his third book, Heavy Metal Fun Time Activity book out the same day! I missed last week’s show. It’s not something I do on the regular, but it couldn’t be helped  I got called to Austin, TX on business. It wasn’t bad  Austin is a great town  but it was on enough short notice that I didn’t have a chance to make note of the show’s cancellation. So to anyone who noticed, sorry. August is Eddie Def month on Gurp City. For the next 4 weeks, we will have a different exclusive cut from Eddie Def featured. The first episode is hosted by DJ Passion. Bump the slumpers of KITTY radio. The Scratch Hampsters and Space Travelers veteran is alive and hasn’t lost a beat. You are currently browsing the Gurp City weblog archives for August, 2007.